In 2016, CVN covered 40 Engle progeny trials, involving some of the top defense attorneys in the country. The cases stem from a class action against the nation’s tobacco companies that the Florida Supreme Court ultimately decertified, allowing individual plaintiffs to rely on the original class action’s jury findings and recover damages if a plaintiff proves that the smoker at the heart of their case suffered from nicotine addiction that led to a smoking-related disease. This year’s Engle Defense Attorney honoree distinguished herself by going undefeated in two critical trials involving her client. The verdicts: Jurors cleared Parker’s client, R.J. Reynolds, of liability in both cases. The details: In January’s Rounds trial, the widow of hospital worker Terry Rounds, who died from lung cancer after decades of smoking, sought more than $14 million in compensatory damages, plus punitives, for what she claimed was Reynolds’ role in her husband’s respiratory disease and cancer. But Parker and her legal team argued Rounds smoked by choice rather than because of addiction, and they claimed he successfully quit smoking in his first serious quit attempt. "The person they are trying to describe to you is somebody who desperately wanted to quit, somebody who hated smoking, somebody who had no choice but just to keep smoking. That's how they're trying to portray (Rounds) at this trial," Parker said. "But we know from the facts of his life that that just doesn't fit." Jurors needed less than four hours to clear Reynolds of liability. The defense verdict came even faster in August's Coursey trial, with jurors absolving Reynolds of liability for the lung cancer death of a former Florida health department worker who had smoked for decades. Parker’s courtroom skill cleared her client of more than $22 million in potential liability in the two trials, and it earned her CVN’s Engle Defense Attorney of the Year title. Next week: CVN's Engle Plaintiff's Attorney of 2016. 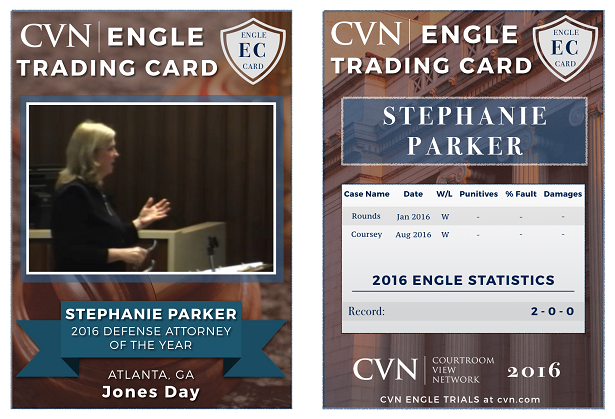 Watch all of Stephanie Parker's CVN-covered trials. Click here to learn more about our unrivaled tobacco litigation library.